The Niagara River is only 36 miles (58 km) long between Lake Erie and Lake Ontario, but it has a number of interesting crossings. 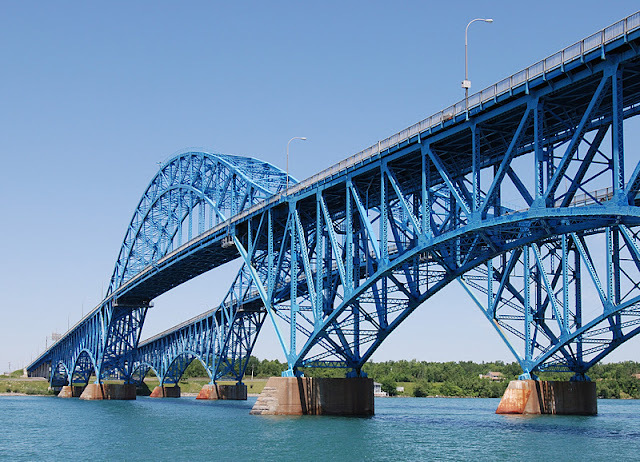 Just south of Niagara Falls is Grand Island with a pair of toll bridges at each end that carry I-190 traffic across the river. The South Grand Island Bridges are 3400 ft (1026 m) long truss bridges with through arches for their center spans. The arches are pinned at the foundations and support the superstructures with steel cables at the middle of the arches. The first bridge was built in 1935 and carried one lane of traffic in each direction. A parallel structure was built in 1962 so that each bridge could carry two lanes of traffic in a single direction. Its odd that the 1962 structure uses the same old-fashioned, laced members as the older bridge. In fact, I had to look closely to determine that the bridge on the left was the newer structure. Both the 1935 and the 1962 structures received poor ratings during recent inspections and are scheduled for deck replacements and substructure repairs later this year. Transportation planners say a third lane will be needed in each direction by 2020, which means the North and South Grand Island Bridges may need to be replaced (for $500 million). There are a lot of truss arches around the world, but they are slowly being replaced with other types of bridges. No one builds trusses anymore. Steel truss bridges need continual priming and repainting to prevent corrosion. However, both of these bridges look well maintained. The harsh winters and use of de-icing agents over the years may account for the deterioration of the deck and other concrete members. Once the reinforcement begins to corrode, there is little one can do. Arch Bridges: South Grand Island Bridges by Mark Yashinsky is licensed under a Creative Commons Attribution-Noncommercial 3.0 United States License.